It's all about double duty! For small-space dwellers, a dining room can be considered a luxury. For the entertainer, it’s an essential. So when a lack of square footage prohibits you from having a proper dining room setup, a little creativity is in order. Whether you’re squeezing in an entire setup in between the living room and kitchen, or sneaking one in all together, careful planning can go a long way. Here’s what you should know. Utilize an area typically reserved for an alternate function and turn it into a dining space instead. Here, an entry is cleverly converted into a cozy dining nook. Bench seating provides ample space for a party of six, while simply turning the table to stand vertically parallel to the windows results in even more sitting room. We’re debunking the myth that one can’t have a dining room in a studio apartment. The secret? A table with a double-duty element of functionality. Bring in a piece that comes with an expandable detail or foldable slab, much like the one pictured here. Alternatively, you can opt for an oversized desk, that can be easily moved to the center of the room when entertaining. In an open floor plan, the lines get blurred when it comes to the layout of the rooms. It’s often difficult to distinguish where the kitchen ends and the living room begins – a detail one can use to their advantage, especially when that involves incorporating a dining room into an area that doesn’t necessarily allow for one. In this light-filled home, a spacious nook is transformed into a cozy eating area that’s decked with plenty of seating options for all. Think small. In lieu of the traditional dining room table (over-sized and lengthy) opt for something a bit more compact. A round table can play to a variety of spaces, instilling an element of continuity. Plus, there’s always time to upgrade to something bigger in the future! Small-space dwellers may be all too familiar with the infamous sofa seat extension – after all, it is an effortless way to squeeze in a few extra spots for guests. 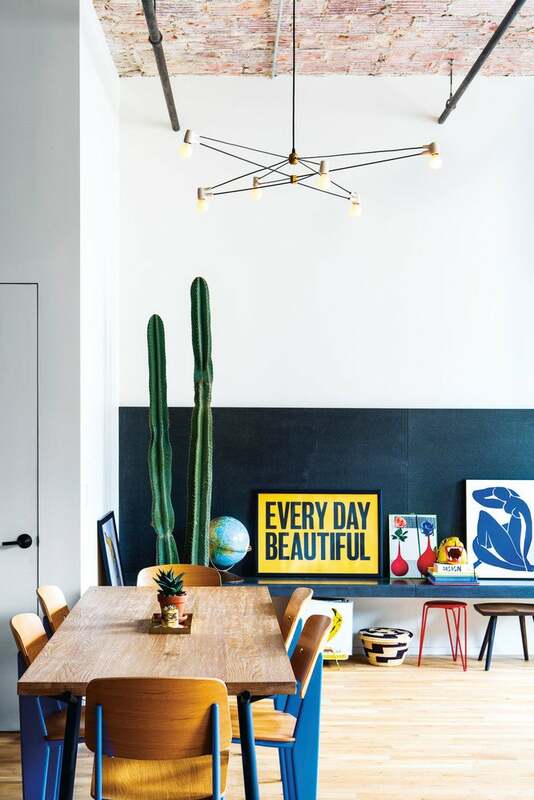 While this method errs more towards the “dining room-on-demand” motif, it sure does do the trick when you’re in a bind. For those who are just starting out, consider this option before purchasing furnishings. A complementary color scheme is of essence, as is a palette of prints and patterns that work well with one another.